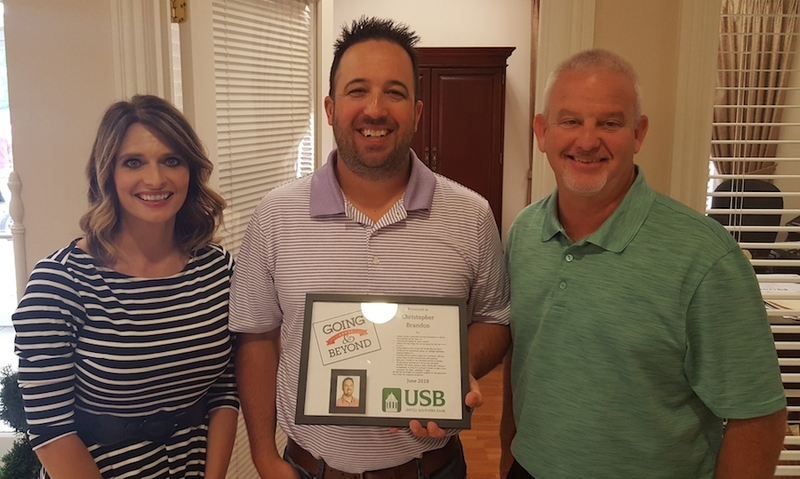 We celebrated Christopher Brandon who was nominated for the Caught in the Act (CIA) award for the month of June. His peers said that he always comes in early when we have bad weather to shovel the sidewalks and put down salt; lowers and raises the flag whenever needed; carries things that are too heavy for the rest to carry; takes care of maintenance issues, i.e. changes lightbulbs, flips breakers etc. Numerous times he has used his own vehicle to jump off customer’s vehicles or push vehicles out of the drive thru that stalled. Christopher is always there to lend a helping hand with anything. He speaks to everyone and is very friendly to the customers and his co-workers. He goes above and beyond to satisfy his customers, whether that means coming in early, staying late, coming in on weekends, or going to a customer’s house to make it more convenient for them—whatever it takes, Christopher will do for the customers. We feel that Christopher is an excellent candidate for this award and is long overdue the recognition he deserves. Thank you for all that you do Christopher! Pictured: Christy Stokes, Todd County Market President, Christopher Brandon, Loan Officer and Billy Bingham, President and CEO. « May Meet & Eat!